Adonis is breathtakingly handsome whose very name epitomizes male good looks. Adonis is the son of a myrrh tree, a wild boar slashed the tree open, performing a Caesarian section with its tusks. Aphrodite rescued the baby, who was already so radiantly beautiful that she placed him in a closed jeweled casket and gave him to Persephone for safekeeping in Hades. Persephone couldn’t resist peeking into the box and was instantly smitten. Adonis grew up in Hades’ palace. The Greek Magickal Papyri, documents from early Common Era Alexandria, classify him as a chthonic Deity (a spirit of the dead) who is able to pass back and forth between the realms of the living and the dead. 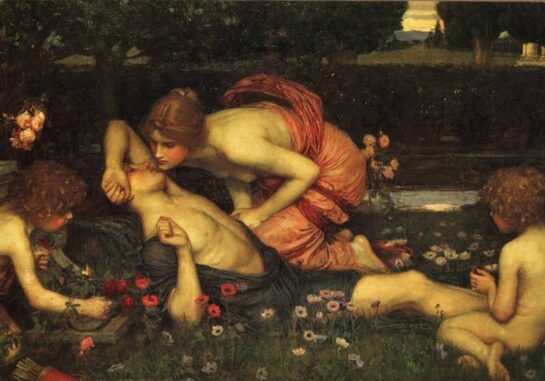 When Aphrodite returned for Adonis, Persephone refused to give him back. The result was an Olympian custody battle. The solution entailed dividing the year into thirds; Adonis was to spend four months with Aphrodite; four months with Persephone ; and he was given four months to do as he pleased. Legend has it that he spent his personal four months with Aphrodite. Adonis is fun, gorgeous, a divine lover in every sense of the phrase. He is a deity of pleasure and has been depicted as a pig God in the form of a sensuous, passionate boar. He loves loving, and he loves hunting. He likes making time with women but is onmisexual. While out hunting, Adonis was gored and castrated by a wild boar, bleeding to death on the shores of the Adonis River in Lebanon. The river, now called Nahr Ibrahim, ran red with his blood. The blood that flowed onto Earth transformed into red windflowers. Explanation of the motivation behind his death varies. There is a mystery as to who sent the boar to kill Adonis. Some say Aphrodite’s passion for Adonis evoked Ares’ jealousy and he attacked Adonis in boar guise. Another version says that Artemis, irritated by Aphrodite, sent the boar, striking at her rival through her lover. (Adonis as a hunting God should have been paying attention to Artemis, the Hunting Goddess, not the Goddess of Love, and so Artemis reacted with rage.) Yet another version suggests that Persephone, impatient with the custody arrangement, decided to make Adonis a permanent resident of Hades. If Persephone is indeed the culprit, then her plans were foiled. The ultimate message of Adonis’ myth is that a love exists that is so powerful the it transcends and prevails over death. Canaanite) Deity. His name is the variant of the Jewish Adonai and means “My Master”, and is thought to be a title rather than his real name. His real name may only have been revealed to initiates of his Mystery tradition. That he was birthed and killed by a boar may explain common Jewish pork taboos. Every year Aphrodite led women in mourning for Adonis. Every year the Adonis River ran red with his blood. (Blood red earth runoff from the Levanon Mountains provides the scientific explanation.) The key to his veneration is that every year Adonis is resurrected. Like Persephone, he eternally enters Death, only to return alive. Grieving women were consoled by the revived Adonis. FEAST: His festival, the Adonis, was celebrated throughout the Mediterranean. Details are now vague, other than it was divided into two parts and celebrated exclusively by women: Part One was dedicated to mourning; women wailed and wept over images of the dead Adonis. Part Two celebrated his resurrection. It is unclear now whether the two parts of the festival were consecutive or whether a lengthier gap of time separated them. In essence he may have had two feasts. At least one of the festival days occurred in early summer. Some theorize that Adonis died near the Summer Solstice and was resurrected at the Spring Equinox. During the festival, women gathered on rooftops at night, drinking and singing. They planted Gardens of Adonis; quick germinating seeds planted in shallow containers, even clay shards. The little gardens were watered daily, stimulating speedy growth. On the eight day, the Gardens of Adonis, never more than sprouts, were tossed into the sea with images of Adonis, concluding the festival. The Adonia, always considered subversive by Greek and Roman authorities, occurred openly into the fifth century, among the most persistent of Pagan festivals. His was always a Mystery religion and so was better prepared than most to go underground when Pagan traditions were banned. Adonis may lie beneath masks of John the Baptist and Saint Anthony, whose festivals are also celebrated in June. His spirit lurks amid Greek and Italian Easter customs; women let bowls of lentils or wheat sprout in darkness, then bring them into the light (often inside a church), on the Thursday before Easter. Adonis may be petitioned in the context of séances or any sort of necromantic attempt to contact the dead. He passes easily between realms and can deliver messages back and forth. He is able to determine where to search for missing people; the realms of the living, dead or both. Petition hi to reveal needed information. ALTAR: Adonis likes company, so make sure there are others on the Altar. Incorporate Aphrodite, Persephone, Astarte, Nymphs, or other spirits onto His Altar.